The use of different Image file formats is a restriction on website design. Altho ugh the majority of users support GIF, JPEG, and PNG (with restrictions), Internet Explorer is the major party-pooper here, not fully supporting PNG’s advanced transparency features. Thus, web designers are restricted to still using the almost obsolete GIF format. 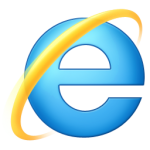 Thanks to IE, GIF continues to be the most widely used graphic file format for transparent images.